(Victoria, BC) - With three games left in the 2018 PDL season the Highlanders have it all to fight for. Despite a tough start to the season, Victoria have had a chance open up to qualify for the playoffs. A strong turnaround heading into the second half of the season and some favourable results has made the final three games of the season more important than ever. 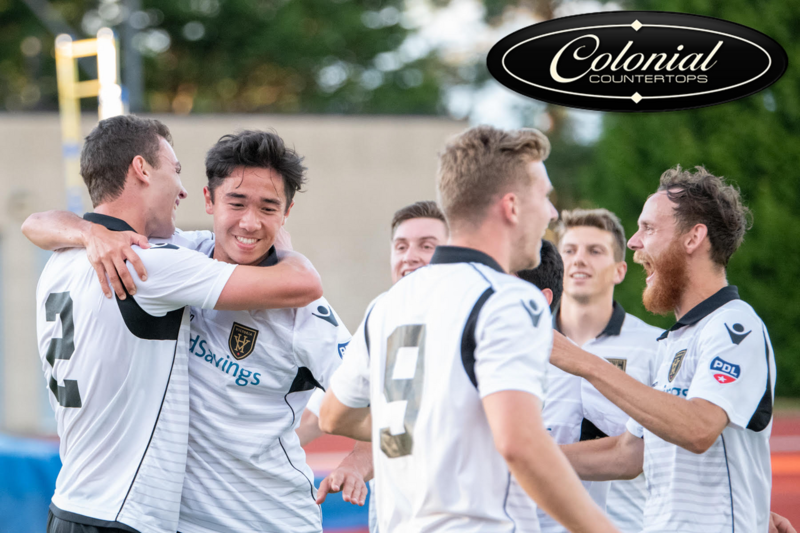 Gameday sponsor Colonial Countertops are pleased to support the Highlanders in their fight for playoffs and proceeds from the match will support Cops 4 Cancer. JOIN US SATURDAY, JULY 14 VERSUS LANE UNITED FC PRESENTED BY COLONIAL COUNTERTOPS! The extremely tight Northwest Division of the USL PDL League has been led this year by a strong Calgary Foothills side. Calgary are already looking towards playoffs sitting atop the table and having clinched the Division Title. Meanwhile, the second playoff spot has been held by Victoria’s rivals TSS FC Rovers for much of the season. For TSS a string of results dropping points has opened the way to a potential playoff spot for the rest of the division. TSS traveled down to Oregon to take on Lane United Sunday, playing out to a stalemate and taking a point a piece. This was followed by a large 4-0 win by the Seattle Sounders U-23 over Portland Timbers U-23. With the recent results all six teams in the Northwest Division have played eleven games. Between second and sixth place a mere four points sit between a potential playoff spot and the bottom of the table. The Highlanders currently are sitting in fifth place with twelve points while, Seattle’s win takes them into second place with fifteen points. This sets the stage for an exciting Friday night clash when the Highlanders travel down to Seattle to take on Sounders U-23 in an attempt to go level on points. The Highlanders are not taking their eyes of the goal of making it into the postseason and with three games left anything is possible. Victoria faces Seattle Friday night, at 7:30 PM PST. The game will be streamed online through the Sounder U-23’s Official Youtube Channel. The Highlanders travel down to Salem, Oregon to take on Portland Timbers U-23 on Wednesday, July 11. Kickoff is set for 6:30 PM PST. Highlanders return to Centennial Stadium for their final game of the 2018 season Saturday, July 14 at 2:00 PM PST. For more information, please visit www.highlandersfc.ca.